My admiration for the congregation here is largely based on my visit to the church on Good Friday 2009. Being a good Mass-attending Catholic, I had set off for a morning bike ride around east Ipswich, safe in the knowledge that I could be back home in time for the 3pm Way of the Cross devotions at my local Catholic church. However, as I passed Alan Road Methodist church, a few minutes from my house, I noticed that it was open, and I could not resist the opportunity to take a look inside. Picture me, if you will: I am wearing a fluorescent orange French football top, and garish shorts. I am listening to loud, frenetic music on my headphones. I look as if I could do with a shave and a haircut. And this, on the most solemn day of the Christian calendar. And yet, the good people of Alan Road Methodist church welcomed me with open arms, and the churchwarden insisted on giving me a guided tour, despite the fact that they were just twenty minutes away from their Good Friday service. All I can hope is that these lovely people have their reward in heaven. The church sits in the fashionable Rose Hill district of Ipswich, not far from Holywells Park and Derby Road railway station. There has been a Methodist presence up here on the heathland for as long as there have been houses: the first church was opened in 1877, and still survives as a hall further along Rose Hill Road, joined to the present church beyond the west end. It is currently used by the church youth group. The usual convention of a church facing east has been reversed here, although such liturgical imperatives are of no concern to the Methodists. The plaque laid by Edward Grimwade on November 16th 1877 is a reminder of this family's involvement in the dissenting church world of the Victorian era. Curiously, there is a memorial to Edward Grimwade half a mile off at St Clement's Congregational church, at the bottom of the hill, a mark of the labyrinthine nature of 19th Century non-conformist denominations. The Grimwades owned Ipswich's main family-run department store, on the Cornhill - it only closed about ten years ago, and for many years the upper storey was given over to the offices of the National Protestant Defence League. The current church was dedicated by William Pretty in 1880. The Prettys were also Ipswich department store owners, and their vast emporium was sited directly opposite Grimwades on Westgate Street. Today it is known as Debenhams. Interestingly, the wife of William Pretty's son is also mentioned on a dedication stone, because when the church hall was built in 1926 she opened it On Behalf of Alan Road Workers Past and Present. Mrs Pretty seems to have drifted somewhat from the Methodist party line over the next decade, because by 1938 she was having mystical dreams, and writing to the papers about them. She encouraged the architect Basil Brown to investigate the mounds in the back garden of her home at Sutton Hoo near Woodbridge - and, lo and behold, the Sutton Hoo ship burial was unearthed, probably the most valuable ancient treasure ever uncovered on English soil. I used to live just around the corner from this church, in Cavendish Street, and I well remember the enthusiastic restoration of this building back in the 1990s. One of the results of this is a pleasing glass frontage within the portico, which floods the interior with light. The chairs are all modern replacements, which is at first a disappointment, but this building has such a sense of being a living worship space it is hard to moan. The original balcony survives, but so does something rather more exciting. The capitals on the high arcade which runs across the sanctuary area are dripping in flowers and fruit, and the glass on either side of the church is in the Art Nouveau style. 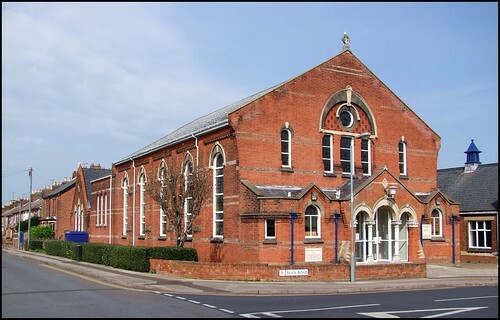 If this is original, and I see no reason to think that it is not, then Alan Road Methodist church is probably the earliest surviving example of the Art Nouveau style in Ipswich.